This surname derives from a 'lost' medieval village. The former village formed part of what is now the town of Bingley in Yorkshire, all trace of 'Hateltun' as it was recorded in the 1086 Domesday Book, having totally disappeared. The Yorkshire Deeds listings of the year 1215 in the last year of the reign of King John, record the spelling as 'Hadelton', and it is clearly from this spelling that the modern surnames (in various spellings) have developed. The village name is Olde English and the translation is 'the hamlet (ton) which stands by the lake or bowl (hadel)', a description which could apply to Bingley itself. 'Lost' villages are quite numerous, but usually the location is lost as well, here we do know the almost exact position. The varied spelling forms now include Haddeston, Hedlestone, Hedylstone etc, and this is quite a normal occurrence, particularly when the place from which the name originated has now disappeared. 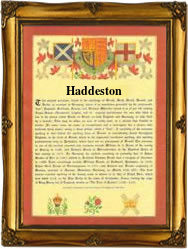 Examples of the name recording include Walterus Haddleston who married Elizabeth Stancliff at Halifax Parish Church on March 17th 1590, James Haddleston, christened at St Nicholas Church, Liverpool, on April 17th 1799, and John Haddleton, christened at St Saviours Church, Southwark, London on March 9th 1817. The first recorded spelling of the family name is shown to be that of Johes Hedylston, which was dated Christmas Day, in the year 1543, christened at Halifax, Yorkshire, during the reign of King Henry V111, known as 'Bluff King Hal', 1510 - 1547. Surnames became necessary when governments introduced personal taxation. In England this was known as Poll Tax. Throughout the centuries, surnames in every country have continued to "develop" often leading to astonishing variants of the original spelling.